As a fanatic for Player versus Player focused games, I made a happy jump into the air when I found out about Champions of Regnum. Especially when I realized it goes beyond simple arena combat and actually follows a realm versus realm model. Desperate for a good RvR game, I didn’t give any other features a look over before jumping straight into the game. But for the less enthusiastic that need to know, Champions of Regnum is a free-to-play fantasy themed game that lets you choose one of three realms to side with. And once that choice is made, there is no going back unless you are willing to abandon all progress on your precious characters. Now before I scare off PvE players entirely, I will mention there are some elements of it present in Champions. But ultimately its presence exists only to make the PvP feel more meaningful. See the map is split up in different zones; you start in the beginners’ area where you can explore safely and become adjusted to the ins and outs of your character in relative safety. The Inner Realm comes next to push harsher challenges at players including tougher quests and hostile creatures. Still not too intense but by the time you fight through it, you’ll have a strong enough understanding of your character to take it to the enemy. Once you’re ready to don your big boy pants, it’s time to meet the other realms head-on in the War Zone. Here you can join up with other players, or with your clan, to defend and take over forts and castles. These strategic points are a key for your realms survival, and thus teamwork is required in your realm to defend and attain these positions. Champions of Regnum’s mechanics favor realm-wide organized strikes as it doesn’t take long at all for an enemy realm to be pushing on the front door of your last castle if all your best fighters are off being heroes in uncoordinated attacks. For players who feel they still aren’t contributing their full value to their realm, arenas are available to practice amongst your fellow realm members. Found within each realm’s safe zone, these arenas allow players from the same realm to have a friendly duel without any punishment for losing. When you have chosen between the three available realms Alsius, Ignis and Syrtis you are ready to make your first character. There aren’t many classes in the game currently, and in fact there are only three at the time of writing this article, which is a tad bit low for a MMORPG in my opinion. But Champions compensates for this by offering two different ways to build each class. Yet I was again disappointed to see the usual MMORPG tropes of warrior, archer, and mage as the class options. If you’re going to only offer three characters, you might as well make them feel new and somewhat unique. 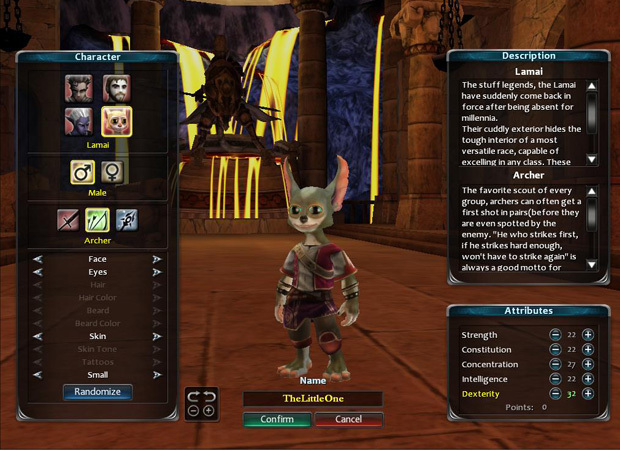 But let’s get back on topic with the options available for making your first character. What the game lacks in original classes it makes up for with some pretty interesting oddball races that set your appearance apart from some of your peers. You can also assign the character bonus stats. I don’t really understand the meaning of these stats since you are only given a few, and once you level up your character the game automatically adjusts your stats for you. I doubt the few extra stats given at the start will influence your character much but I shouldn’t complain as it doesn’t hinder or help gameplay much. Classes are differentiated by their equipment, from warriors wearing the heavy armor and mages wrapping themselves in what might as well be enchanted paper. But the weapons are well done and offer one of the best vehicles in the game for players to specialize and differentiate themselves. Each class has a different set of weapons available that when combined with the different builds offers diversification through specialization that has a serious impact on realm vs realm combat. Sure you will see a tree here and there, and occasionally some rocks, but overall the game doesn’t cut it here. The textures are also low quality and hopefully will an area of focused improvement going forward. 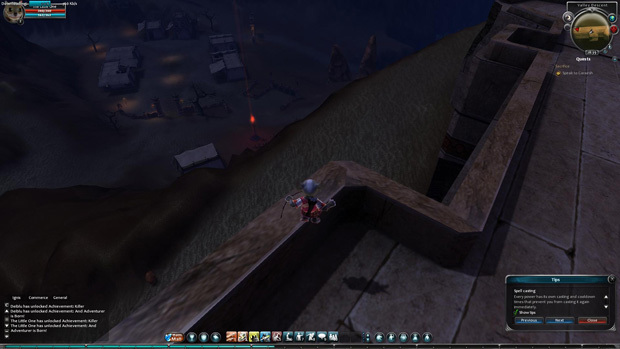 Multiple occasions where my character would just bug through the map into a region of empty space combined with a few staircases that I simply couldn’t climb further hit my ability to become immersed in the gameplay. When I play a MMORPG, I need to feel like I am part of the story and the environment plays a huge part in making the setting believable. Champions of Regnum failed to accomplish this for me and despite the core mechanics and classes being solid, many areas of the game felt incomplete. The concept of the game is great and it’s disappointing how few new titles there are on the market going in this direction. As such I feel the game should do well enough on this aspect to be successful enough to roll out plenty of future polishing updates to iron out the rough edges. I might come off harsher in this article than most others I’ve written, but it’s just because I see the potential Champions of Regnum offers and don’t want the developers to settle and let it all go to waste. 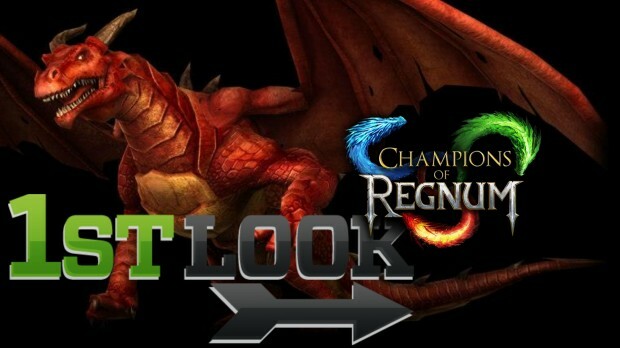 Be sure to catch Bakerman Brad’s First Look to get a visual overview of Champions of Regnum! thanks for the review! hm i think the players who enjoy regnum have become used to using their imagination to fill in any possible lack in detail in gfx. It depends on your preference i guess. I’ve played other huge and beautifully detailed mmos like DDO, but the gfx tends to tire the eyes and also distracts from the real purpose which is RvR pvp. 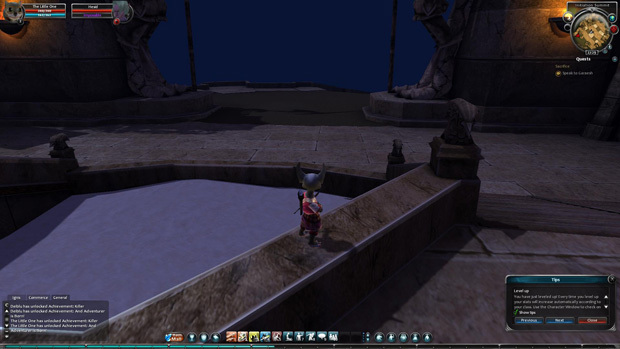 Also, the more time you spend exploring and experiencing Regnum, i found that the map had a lot of very unusual nooks and crannies and easter eggs. Like a really quiet waterfall which was beautifully made. The realms do tend to grow on you with their quiet mesmeric beauty. 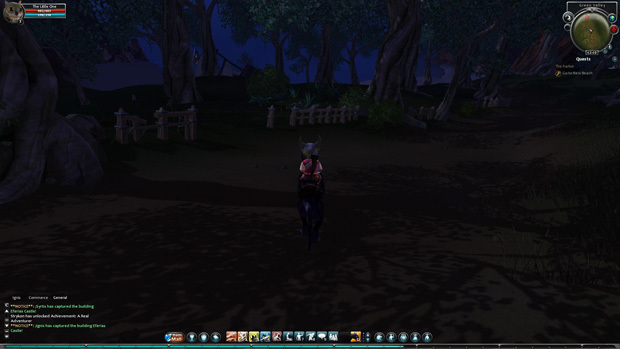 In fact, I found Regnum to be vastly more immersive as an mmo than say silkroad or ddo. There is something about the quiet empty beauty which points to the irony of bloody war happening all the time.